Climate change is expected to decrease heating demand and increase cooling demand for buildings and affect outdoor thermal comfort. 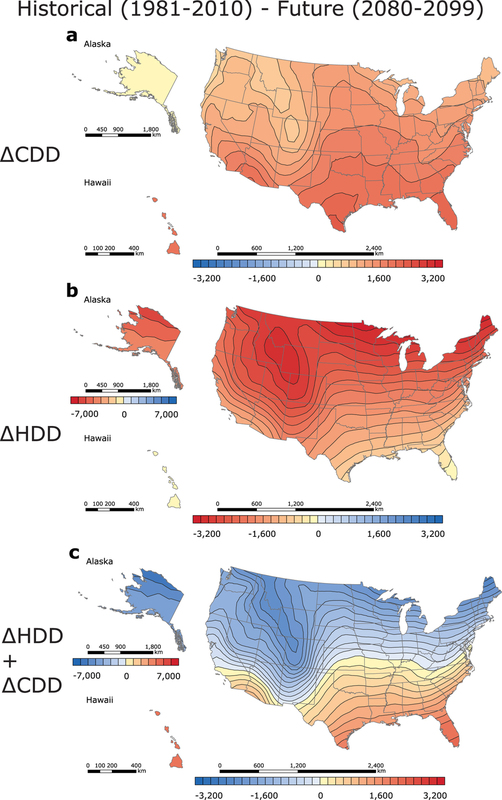 Here, we project changes in residential heating degree-days (HDD) and cooling degree-days (CDD) for the historical (1981–2010) and future (2080–2099) periods in the United States using median results from the Climate Model Intercomparison Project phase 5 (CMIP5) simulations under the Representation Concentration Pathway 8.5 (RCP8.5) scenario. We project future HDD and CDD values by adding CMIP5 projected changes to values based on historical observations of US climate. The sum HDD + CDD is an indicator of locations that are thermally comfortable, with low heating and cooling demand. By the end of the century, station median HDD + CDD will be reduced in the contiguous US, decreasing in the North and increasing in the South. Under the unmitigated RCP8.5 scenario, by the end of this century, in terms of HDD and CDD values considered separately, future New York, NY, is anticipated to become more like present Oklahoma City, OK; Denver, CO, becomes more like Raleigh, NC, and Seattle, WA, becomes more like San Jose, CA. These results serve as an indicator of projected climate change and can help inform decision-making. Figure 5. CMIP5 future (2080–2099) changes in historical (1981–2010) US CDD, HDD, and HDD + CDD. (a) Δ CDD. (b) Δ HDD. (c) Δ HDD + Δ CDD. In Fig. 5b,c, Alaska (− 7,000–7,000 Δ degreedays, step 1,000) is found on a different scale than the contiguous US and Hawaii (− 3,200–3,200 Δ degreedays, step 200), because of Alaska’s high Δ degree-day values. Δ Degree-days were obtained by subtracting historical (1981–2010) annual degree-days (calculated for each NOAA’s weather station) from the CMIP5 multi-model median degree-day projections (2080–2099). The maps were generated in ESRI ArcMap 10.2 (Environmental Systems Resource Institute, ArcMap 10.2 ESRI, Redlands, California, USA) using an ordinary kriging tool.